*Extend Rent Protections to all Mitchell-Lama and Section 8 buildings that leave government programs. What’s Happening? On June 15, 2011, state rent protection laws will expire, threatening the stability of NYC and suburban neighbor-hoods and putting HUNDREDS of THOUSANDS of New York residents at risk of losing their homes. 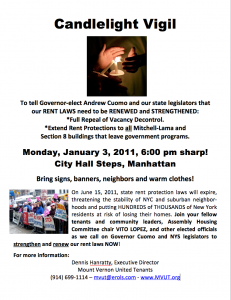 Join your fellow tenants and community leaders, Assembly Housing Committee chair VITO LOPEZ, and other elected officials as we call on Governor Cuomo and NYS legislators to strengthen and renew our rent laws NOW! Tuesday, January 4, 11:45 AM, State Capitol, State St. Entrance. The rally will call for job creation for welfare participants and other low-income individuals; strengthening the state’s safety net; and promoting progressive revenue options to resolve the state’s projected $9 billion deficit. Please call the MVUT office if you’re interested in attending – (914) 699-1114. Now, more than ever, New York needs to preserve its affordable housing. The losses of subsidized and regulated housing have severely limited housing options for New York’s working families. 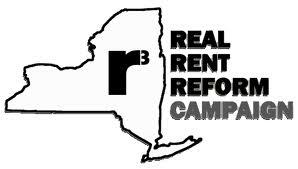 The Real Rent Reform Campaign focuses on preserving over one million rent-regulated units and tens of thousands of apartments in the Mitchell-Lama and Project-Based Section 8 subsidy programs. 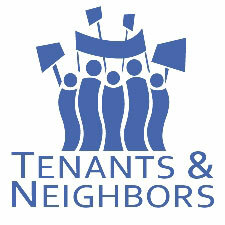 Along with many unions, housing groups, and community based organizations, Mount Vernon United Tenants has joined this important statewide campaign to fight to strengthen and preserve our affordable housing programs. Watch the video below of our efforts over the course of 2009 to push our package of rent reform legislation.